Painted Lady Caterpillars. These brown-black caterpillars (also called thistle caterpillars) have a yellow stripe down the length of both sides of the body, and have spiny hairs on the body. They reach up to 1.5 inches in length at maturity. When they feed they web together leaflets. They mostly feed on plants in the family Compositae (thistles, sunflowers and related plants), but also feed on soybeans. There are usually two generations in the midwestern U.S.
Green Cloverworm Caterpillars. These pale green caterpillars have two white stripes running the length of the body. They reach about 1 inch long at maturity. Larvae are distinctive among common soybean caterpillars in that they have three pair of abdominal prolegs, while many other common caterpillars have two or four pair. Estimate defoliation levels in several parts of the field. Assess defoliation over the whole plant canopy, not just the upper leaves. In vegetative (pre-flowering) stages, consider treatment if the insects are present and feeding, and defoliation will exceed 30%. In pod-forming or pod-filling stages, consider treatment if the insects are present and defoliation will exceed 20%. These percentages can vary 5% to 10% according to the stage or type of insect(s) present, environmental conditions, the specific stage of the soybean, and the size and condition of the canopy. 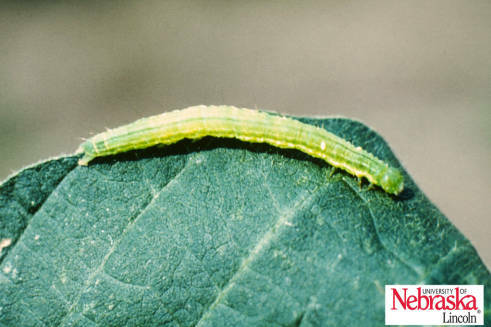 Several foliar insecticides labelled on soybeans have activity against these and other caterpillars. 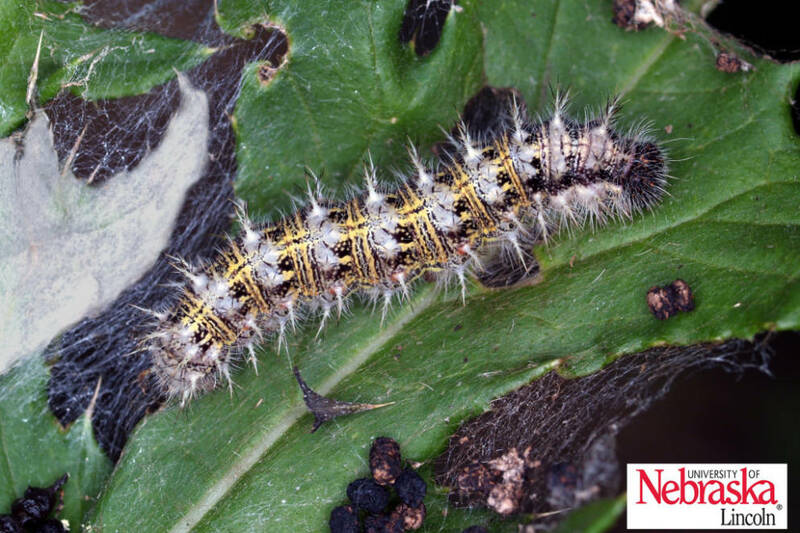 See the Insecticide Section in Nebraska Extension's Guide for Weed Management with Insecticide and Fungicide Information (EC 130) for specific information on products, rates and restrictions.